The snow is falling here in Lake Placid this morning. Granted, that is not such an unusual sentence to read on a lifestyle blog about the Adirondacks. The National Weather Service has issued a Winter Storm Warning for the region so it is going to be a big one. This is not necessarily news. It is not out of the ordinary for many inches of snow to fall and accumulate in the Adirondacks. The odd thing about this snow storm, the part that allows my family and friends who live in the tropics south of here to brag a little about the leaves on the trees and consistent 70-degree temperatures, is the date. Today is April 27, almost May Day. 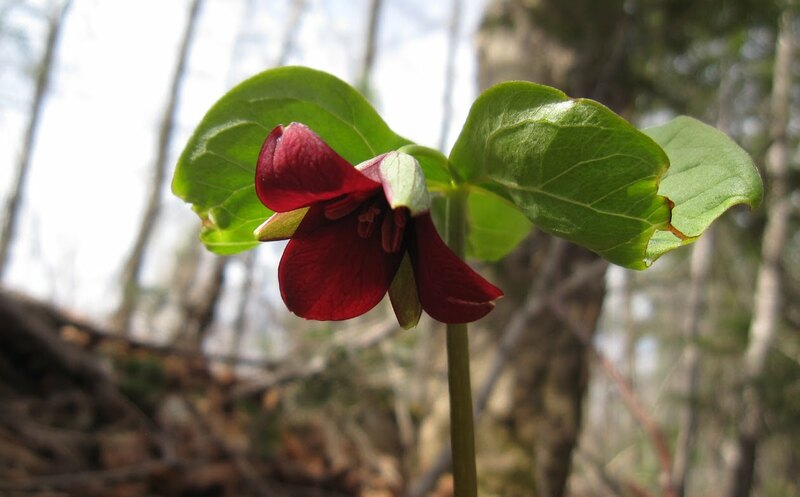 Beautiful wildflowers are just starting to bloom, and a foot of snow could fall in the Adirondacks. This has happened before. Every time it does, I worry about the new wildflowers and if they will be there when the snow melts. Then I remember how they've always come back, petals and leaves mostly intact. This miracle never gets old, the flowers always look better than ever once the snow melts. The wildflowers survive the storm because they are flexible. They go with it, a little snow on their back, no problem, they relax and remain pliant, but confident in their natural strength. People who live here do this also. It is a well known fact: resiliency is a trait of things and people who survive in the Adirondacks. A foot of snow in late April? No problem, put the road bike away and get out the skis. Trillium from the trails at John Brown's Farm in Lake Placid, courtesy of Joann Sandone Reed.